Walking into the Barrington Fine Rug Gallery I was transported to exceptional fine rug galleries and museums I have visited. Working in commercial interiors for the first eleven years of my adult life, I came to know finer furnishings and interior elements of good design. Working out of the Merchandise Mart for most of that time, I represented and had close friends who represented some of the best made and most beautiful products. Whenever I had the time, I would wander the showrooms of the Mart and dream about the home I would have filled with what I saw. Beautiful carpets and rugs were always the grounding pieces to the rooms I imagined. Fortunate to travel for business and pleasure outside of the United States, I have seen priceless rugs and tapestries in museums around the world. While on a luxury cruise in 1999, my husband and I spent almost an entire day in a fine rug gallery in Kusadasi, Turkey. Wandering through the gallery, the patient salesman educated us about the many styles and ways carpets are crafted from tradition in different countries and the value of investing in quality rugs. 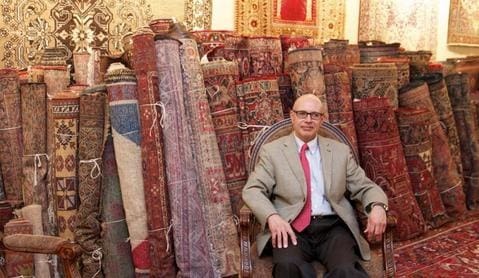 When I met Mostafa Beik, owner of the Barrington Fine Rug Gallery, I found someone with more experience, history, and understanding of fine carpets, with the addition of an impressive collection of rugs from all over the world. How long has your family been collecting fine carpets? The family has been collecting fine rugs and carpets for over one hundred years. This love of artisan quality carpets transitioned into our business which has been passed down from one generation to the next. The roots of the Barrington Fine Rug Gallery are part of our Persian heritage and traces back to the great Carpet Bazaars of Persia. This epicenter of carpet making is where my love and appreciation of fine carpets started. This love was ignited in me by my father and other members of our family who grew up around artisans who created fine carpets such as the ones in our collection. Who started the business and what types of carpets did they start with? My great-grandfather started the business over 100 years ago and passed it to my grandfather. When my father took over, he spent the last 50 plus years scouring Persia for fine vintage carpets. These vintage carpets came from some of the best-handcrafted artisan workshops in Persia, mainly the major carpet weaving cities like Tabriz, Isfahan, Nain, Qum, and Kashan. Can you talk about your collection, where did your collection of carpets come from? The seeds of the collection were the very fine “artisan workshop” carpets that were part of my father’s personal collection. These are some of the finest carpets that were produced. This era of fine carpet making was largely prior to 1970 and these creations are considered “vintage”. My own personal collection, which has been acquired in the last 30 plus years are antique carpets from around the world including European, Indian, Chinese, Turkish, Caucasian and now even American crafted carpets and tapestries. The focus has been on their uniqueness and those pieces that are a true work of art. Each one of the items in the collection was studied and selected from some of the finest estates and museums from around the world dating back to the late 1700s and early 1900s. When did you start to appreciate carpets and specifically antique carpets? Growing up around the family business and apprenticing with my father, I have been trained in how to appreciate fine carpets. Over the past 30 years, while working in the Corporate world, I continued to study and learn more about antique carpets and woven arts from the early 1500s. Those early items from the early 1500s are now part of the great collections in museums such as the Metropolitan Museum of Art in New York and the Victoria and Albert Museum in London and others around the world. My own personal collections are mainly from the late 1700s and early 1900s. What are some of your favorite carpets in the collection? That is like asking which is my favorite child. It is tough to select one or two since the whole collection has been a labor of love and appreciation. I have been fortunate to be able to acquire truly great pieces of art from world-renowned Persian artisans that lived in the mid to late 1800s. In addition, I have a select number of French Aubusson carpets from the 1800s including one from the collection at the Hillwood Estate Museum and Gardens in Washington DC which was the home of Marjorie Merriweather Post, who founded the General Foods Corporation. What types of carpets are popular now? Today most of what is known as “handmade carpets” are sold in home furnishing stores and are produced in India, Pakistan, and Asia. Their focus is on the low-cost production of carpets, however, they very little in common with the great traditions of the past. Although they might be labeled as “handmade oriental carpets”, the quality, the material used, the craftsmanship and the designs are not much different from decent quality machine made carpets. Fortunately, there are still many individuals that have great taste and who desire and appreciate the finer things in life such as these fine antique carpets. These individuals have been acquiring great pieces of woven carpets and tapestries which as years go by becoming rarer and harder to find. What are the qualities of carpets that have increased in value over time? There are several factors that go into how the carpet is classified including the fineness of the weave, how tight it is. Then there are other areas like the color, which vegetable dyes were used. Additionally, there is the design, or the creativity or artistic quality and finally the material or the quality of wool or silk that was used. Our focus in Barrington Fine Rug Gallery is on true one-of-a-kind handmade art pieces that were produced in the 18th, 19th and early 20th centuries. Our collection encompasses fine carpets from Persia, the Caucasus Region, the Middle East, Central Asia, India, China, and Europe that are truly works of art in every aspect including design, colors, quality of materials and workmanship. I have been blessed to live in the Barrington Area from the early 1990s. I have been actively involved in some of the not for profit organizations around Barrington including the Barrington Art Council which unfortunately no longer exists, and others. I feel very strongly that the “Arts” bring a lot to the quality of life of a community but need active support. What did you do before opening the Barrington Fine Rug Gallery? My career had been in Academia and the Corporate world. Although corporate life was my career, my passion and love have been antique carpets and the appreciation for them. As others might have a passion and love for their horses or their car collection, fine carpets have been my passion. My career started as a research professor at the University of New York. Then, my career followed as a business executive with large corporations in various product Research and Development, Strategic Planning and business development roles. As part of my corporate roles, I traveled extensively all around the globe. During those travels, I had the opportunity to see first-hand the workshops and visit the ancient bazaars where one could find a hidden gem in carpets. Sometimes you could imagine how it must have felt for the famous Italian explorer and businessman Marco Polo (1256-1324) walking through those ancient bazaars on the Silk Road. This was a tremendously rewarding experience. What do you think people looking to purchase a fine rug should know? Are you looking for just a floor covering or are you looking for a fine antique carpet as the foundation of your interior design? Are you looking for a wall covering or a piece of art? What is the history of the carpet? Where was the carpet made? What region is the carpet from and who crafted it? How rare is this carpet? The benefit of building a relationship with a gallery over time is you can select the right piece that fits each individual and family need. The gallery should be willing and interested in working with the client and the designer to find that right piece. Finally, the gallery should be focused on and specialize in fine carpets so that they can be a qualified advisor. Aside from beautifully made carpets, what are some of your other interests? In general, I appreciate a variety of fine arts including design. I love to listen to Classical music. I have been a member of the choir in one of the churches here in Barrington. I enjoy seeing and riding in vintage cars, especially European cars from the mid-20th century. I also appreciate the architecture and designs of buildings especially those here in Barrington. Aside from your gallery on Main Street, where else can people see you and your carpets? An important part of the Barrington Fine Rug Gallery is to invest in the community. To that end, I am connected with a number of not for profit charities and educational causes. Combining my belief in supporting the local community with my passion for the arts, I am planning to participate in the upcoming Hands of Hope event Barrington Country Garden and Antique Faire in June. I hope to see you there. I am also looking forward to taking part in Art in the Barn this Fall of 2017 that supports Advocate Good Shepard Hospital. Over the years, I have been an ardent supporter of such events as part of giving back to the community. Also, I am planning on having some free educational events here in Barrington and in the larger community.